Meditation has been used for centuries as a method for calming and clearing the mind and relaxing the body. It is a known technique that works and has been used for stress reduction by the medical profession by both doctors and hospitals world-wide…but can it actually help you to lose weight? Meditation is a tool…a very powerful tool that allows you to release your thoughts and in so doing, transcend into a peaceful state of being. All that inner “chatter” that rules your life daily…that runs on autopilot begins to be silenced. That in turn lowers your blood pressure and reduces stress. Remember, when you are stressed your body ups your cortisol levels making it harder to lose weight. Not only can these incessant thoughts that rule your life cause stress, they can be downright destructive and cause anxiety and unwarranted fears. Meditation reveals that we are not in fact “our thoughts” at all and that we are the power behind our thoughts and as such are empowered to control our thoughts. Meditation puts us in touch internally as we begin by following our breath and listening to our hearts. We discover there is another world…our inner world…it is the inner world of “cause”…it’s been there all along but we’ve been focused only on the outer world of effects. We begin to “see” the program running and becoming aware of it is the first step to changing it. With less confusion and clarity of mind we’re more in tune to what our body is really asking for and when. So, in a real sense, meditation can actually help us to lose weight. This balancing of mental and physical states helps eliminate pesky food cravings…you know, the ones that have little if any nutritional value but lots of calories. With clarity of mind, we begin to see our emotional eating habits clearly and distinguish them from when we are actually hungry…when our body is actually asking for and needs more energy. Your daily actions with food begin to change as regular mediation lifts your awareness and now you are much more observant about what goes into your body and how your body responds to certain foods and whether they make you feel better or worse. The awareness of the mind-body connection is getting stronger than ever as more and more people come to the realization that everything begins in the mind…including the present weight or health situation they find themselves in. Permanent weight loss or a healthy strong body cannot be achieved without a mind-body connection…without both the mind and body working in alignment of feeling, thought and action. With your awareness planted in the present moment, it will become obvious to you how low vibration foods such as processed foods make your body feel slow and low in energy and vibration, how they seem to zap the life out of you, while high vibrating foods…foods that are enjoyed in their natural state…or close to it make your body sing with health. Meditation is not limited to sitting in lotus form quiet for hours. There are so many forms of meditation that have been developed it’s just a matter of searching out a good fit. 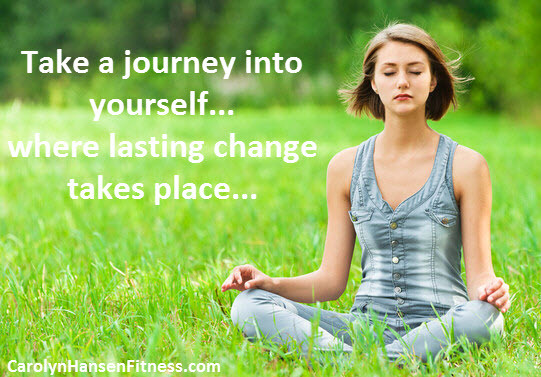 You may even opt for a “guided meditation” focused on weight loss. You can even create your own meditation spaces and exercises. The important thing to remember with meditation is that the goal is to release yourself from your programming. To quiet the mind and discover the source of silence within you. If it works for you, that’s all that matters.